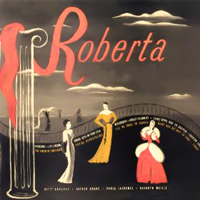 Film Soundtrack: Lovely to Look At, 1952 (MGMlRhino-Turner) (2 / 5) In venerable musical comedy tradition, the central couple in Roberta carries the plot and love songs while the secondary pair gets the zingy numbers and incidental shtick. 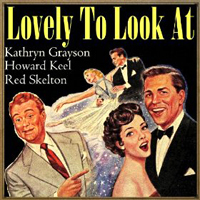 For the MGM film version of the property, retitled Lovely to Look At, three couples are on hand: Howard Keel and Kathryn Grayson for the romance, Marge and Gower Champion for song and dance, and Red Skelton for shtick and Ann Miller for zing. The whole thing is dauntingly glossy, but there are some nice moments. Keel and Grayson perform in synch with their reputations: He’s strong-voiced, she’s shrill. The Champions could never replace Astaire and Rogers, but they’re fun on their own terms, and Miller belts out “I’ll Be Hard to Handle” in her best earthy style. The CD includes some interesting numbers that were cut from the film, and boasts crisply remastered sound. — R.B. Studio Cast, 1953 (Columbia/Sony) (3 / 5) This well-cast Roberta features Stephen Douglass making wonderfully virile sounds that come close to overpowering the sweetly tentative singing of Joan Roberts. Jack Cassidy and Kaye Ballard, a pair of pros recorded early in their careers, are perfectly attuned to the lighter Kern style; Cassidy’s work in particular is effortlessly suave. Portia Nelson is a full-voiced Aunt Minnie (a.k.a. Mme. 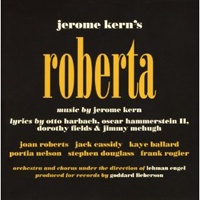 Roberta), and Lehman Engel’s idiomatic conducting ensures that, unlike the MGM film soundtrack, Kern’s work isn’t smothered by too much schmaltz here. — R.B. Studio Cast, 2014 (New World Records) (5 / 5) Far too many of Jerome Kern’s shows have not been fully served in the recording studio. Happily, in 2014, Kern’s divine score for Roberta was taken off that list with yet another painstaking reconstruction from the intrepid arranger/editor Larry Moore and the good folk at New World Records. From beginning to end, we are given a full sense of how the show worked, with much of the dialogue included along with the music. There are frequent reprises, among them an especially beguiling “The Touch of Your Hand” for female trio. Robert Russell Bennett’s orchestrations sound as beautiful now as they did in 1933, if not more so, and conductor Rob Berman and the Orchestra of Ireland gives them all the care and lilt they deserve. Nor is the cast any kind of a letdown: Annalene Beachey is lovely as Stephanie, and even manages a credible Russian accent; Jason Graae is swell in the Hope/Astaire role; and Patrick Cummings makes a sturdy, romantic John. The role of Scharwenka is probably impossible to underplay, and few musical theater recording mavens will be surprised at how far Kim Criswell goes with both the accent and what can gently be termed some exuberant transitions from one vocal register to another. Opera veteran Diana Montague sings a sumptuous “Yesterdays,” and Laura Daniel rates a bouquet for her purring, creamy-toned, absolutely despicable Sophie. 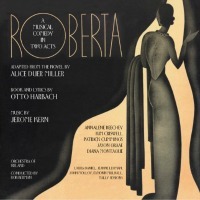 With this much class and skill, Roberta soars as a worthy musical comedy, instead of some folderol with good tunes. Kern wins out, and so does the listener. All that’s missing is a fashion show. — R.B.